Last week Brad and I had a great dinner at James, a little restaurant in our neighborhood in Brooklyn that was participating in Edible Brooklyn’s “Eat Drink Local” week. 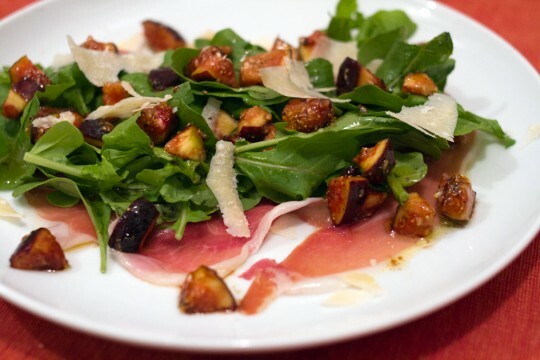 One of the many delicious things we ate that night was a simple, yet decadent fig and prosciutto salad. A few days later I spotted some fresh figs at our Food Coop and decided to make my own variation on it. I’m pretty certain this is going to be a new fave in our house. This is a rough estimation of a recipe, just use the best ingredients you can find (good olive oil and balsamic will make a world of difference) and you can’t go wrong. I’ll say it makes 4 servings as a salad course. Cut the stem and the base off the figs, cut in half lengthwise, then into strips. Cut the strips into 1/2 inch pieces. Toss the figs with the olive oil, balsamic, and a bit of salt and pepper to taste. Allow to rest for a few minutes. Compose the plates: Lay the pieces of prosciutto in a single layer on the plates. Pile the arugula on top, then scatter the figs (give them a good toss first) over the arugula, drizzling any remaining dressing. Top with shavings of Pecorino Romano. 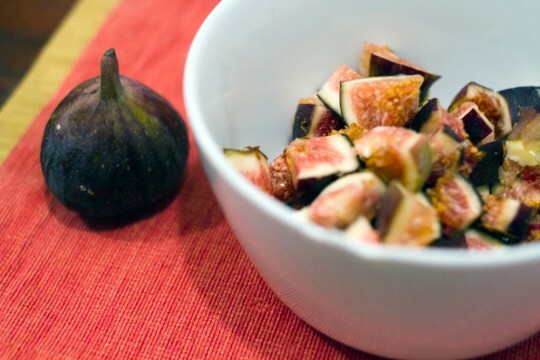 *Bonus: Here are some handy facts on figs and how to store and cook them from The City Cook.